I know a lot of you have been waiting eagerly for this post!!! 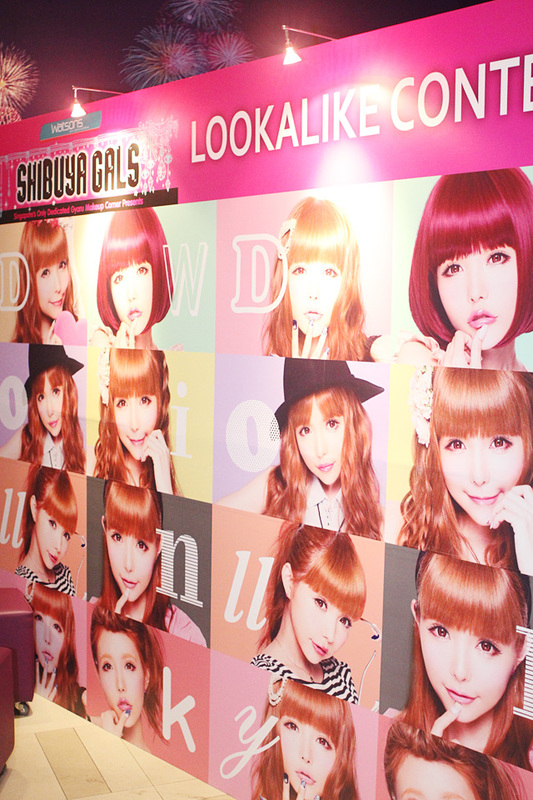 Coz it's photos from when I met Tsubasa Masuwaka when she came to Singapore for Dolly Wink!! Super regret giving up on my Japanese classes because I had a lot of chances to actually talk to her but of course I cannot speak Japanese and she can't speak English, so those moments were spent in silence. :( Wish Cheesie was here to help translate! First day was her press conference... Also a chance for me to meet the girls of the Dolly Wink Lookalike Contest, where I was to be a guest judge! After much anticipation... THERE SHE IS!!! She's super pretty and petite irl!! Looks just exactly like her photos! In any case I didn't photoshop her in any of the photos I'm gonna be posting (coz she really doesn't need it), so you can judge for yourself. These girls are the finalists for the Lookalike contest!! I must say I am really impressed... Before the press conference the girls were gathered in a group and seeing such a big group of very pretty (and vain, haha) girls is slightly alarming and intimidating... They all looked so spectacularly out of place in Singapore with their bright hair and dolly eye make up. They would have fitted right into Shibuya 109 and nobody will think they aren't Japanese! So yes I'm really impressed with the effort they all put in and the authenticity of their "gyaru-ness". Plus they are all so pretty! Even Tsubasa herself, when asked to give them advice for tomorrow, said she had none really as they all already looked so perfectly gyaru. Want to rant a little here... Someone commented to me that "they all look the same". I don't think this is a fair thing to say. 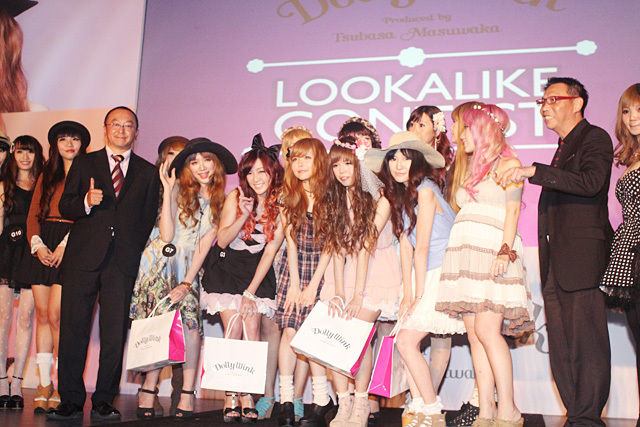 Sure, gyaru fashion has a distinct style and maybe, when seen in a big group like that, a lot of them look similar in light ash hair, false eyelashes or floral print clothes. But if you put ANY fashion style of people together, they will ALL look "the same". For example, to everyone else a group of goths all look the same. Or a group of heavily tattooed and pierced people, all who strived to look "different" by imprinting their bodies with difference designs and piercings, all look "the same" when viewed in a group. If you adopt any style at all, you are bound to look the same as people with the same taste as you, because there are so many people in this world trying to find their style that nobody is truly unique! Even if you choose to not wear anything at all, you will still look "the same" as the other nudists around the world! But to someone who is interested in gyaru fashion, you will be able to see... Oh some of the girls are going for the Mode style, some are going for the hime style... Just as someone who is into goth can possibly tell between different goth styles. And so what if the girls look similar to each other? At least they stand out from regular girls and go for a look that they love, to represent themselves... If you don't bother dressing up at all, you think you look so unique? No, you just look "the same" as any other lazy person out there! In your, god forbid, black leggings worn as pants. I'd rather look the same as people with the same passion as me than look the same as lazy people who do not even bother dressing up, which is like 80% of the world, thank you. After this I had an interview session with Tsubasa herself!!! She gave very lengthy and detailed answers to every question and at the end of the interview she had to say "Hi, I'm Tsubasa, keep watching Clicknetwork dot tv." Even though it's a relatively simple sentence for us, it is a little challenging for her as she can't speak English well, but she still so nicely obliged. She practiced over and over again before she got it perfect for the camera. Overall I'm just really impressed with her work ethics because she flew into Singapore early that morning... Japan to Singapore takes about 7 hours. After she landed she immediately had to do a photoshoot for Nylon magazine (I know because Rozz's bf is the photographer and she told me that he shot a Japanese celebrity that morning which reminded Rozz of me haha... Highest praise ever). Anyway Nylon magazine is out already so do go check it out! After her photoshoot, which must have been exhausting, she had to attend the press conference and do press interviews, which must be pretty dull for her! Imagine people asking you similar questions over and over again for YEARS! That's why I'm surprised that even though we were the last to interview her, she didn't patronise us by giving short answers and wanting to escape to her hotel room asap to rest... In fact she was very patient and obliged to every request!! I was about 6 months pregnant. Now I'm 7 and a half! She's so gorgeous and perfect!! Her face is super tiny wtf I had to photoshop mine like 40% smaller just to make it look like my head is vaguely the same size as hers fml. Anyway if you are wondering what's going on with my awful black roots... Well I keep getting people criticizing me for dyeing my hair while pregnant. My gynae Dr Law Wei Seng actually said it's perfectly safe to do so and after all the research I did I realised that there is no conclusive evidence that it will harm the baby, although most people suggested only doing it after the 1st trimester (which I did). But even though I believed that it is safe, to stop all the criticism and to err on the side of caution I tried to minimize hair dyeing... Thus I tried to tolerate the black roots for as long as possible, which resulted in the above travesty. FYI I have since done my roots once more and my hair is now blonde again. 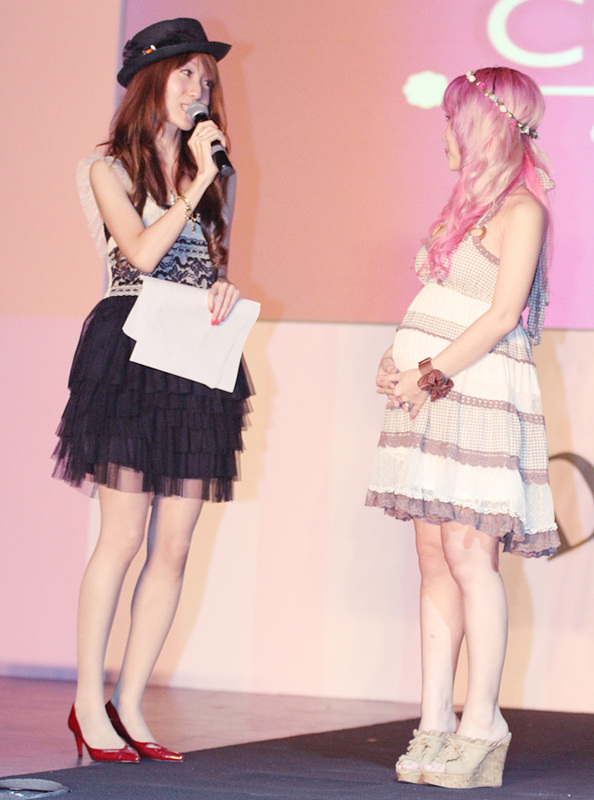 Hey baby-in-my-belly, you got touched by the most famous gyaru mama in Japan!! Most celebrities just sign but not her!! Is it in the Japanese culture that everything people do, they must do better?? You can see she drew with so much effort on every postcard for her fans... Super sweet!!! I'm pretty sure her hardworking attitude has everything to do with how incredibly successful she is. She mentioned during her interview that she oversees the design for each and every Dolly Wink eyelash to make sure they are perfect... How she gets any sleep at all is anyone's guess!! Look how happy I am! 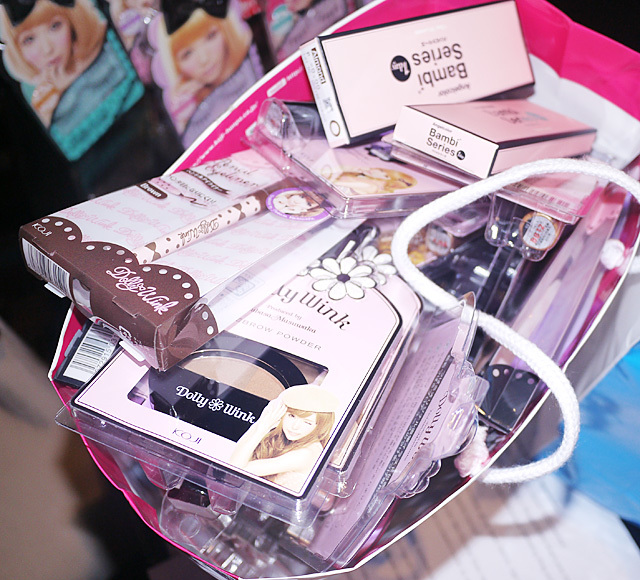 Coz Tsubasa gave me a HUGE bag literally overflowing with Dolly Wink products!! Plus I also get her new product... Bambi Series contact lens!! She told me these aren't even out in the market yet and I am telling you guys I super LOVE them coz they are ONE DAY lens!! I'm just happy to see a new player in the coloured one day lens market!! I also get two of her Milky Bunny CDs, signed!! Ahhhhhhhh!!!!! Luckiest girl in the world is me!!! After this, unfortunately, I couldn't take any other pictures because I had to go on stage already. So the rest of the photos are the official ones! Me chatting with the host, who can speak both fluent English and Japanese. The event was so fun,.Tsubasa, the Japanese Boss of Koji and I were sitting at a booth at the back where we were to judge the finalists' catwalk and creative answers to the host's questions. All the girls did such a fantastic job! Here's the runner up Golly Locks... She's super pretty and tall wtf. She went with a summer-y mode style. If you wish to see more photos check out the facebook album for that day's event HERE!! Really hope to see more Singaporean girls try out the gyaru style... If you want to start, you can start by experimenting with Dolly Wink makeup... Quintessential gyaru makeup brand! Of course, stay inspired by Liking the Shibuya Gals facebook page! !